Mobile analytics and marketing startup WizRocket, run by Mumbai-headquartered WizRocket Technologies Pvt Ltd, has raised $8 million in a fresh round of funding from Sequoia Capital India and existing investor Accel Partners. The funds will be used by WizRocket to grow its 'prescriptive engagement' platform and for developing a ‘naked API’ that offers developers code-level access to customising user experiences, the company said in a statement. WizRocket is a SaaS-based analytics tool that helps websites measure and improve user engagement, visit frequency, retention and conversion metrics. It also enables internet businesses with web messaging, push notifications and in-app messaging, and enables them to reach customers via SMS or e-mail. WizRocket claims that its platform can be used to build one mobile app that creates multiple dynamic experiences for users. “As the mobile app market grows exponentially, marketers and developers need the next generation of tools. By building intelligence into the platform, WizRocket offers marketers and developers a powerful platform to understand and customise the user experience,” said Malcolm Friedberg, chief marketing officer of WizRocket. The startup was founded in July last year by Sunil Thomas, Anand Jain and Suresh Kondamudi, all of whom were colleagues at Network18 prior to launching this venture. A University of Washington alumnus, Thomas was earlier CTO at Infospace Inc. Jain was previously CTO of local search site Burrp.com. He had also worked at Motorola and ATT Wireless before. Kondamudi is an IIT Madras alumnus and had previously worked at Qwest Software and JiGrahak Mobility Solutions. 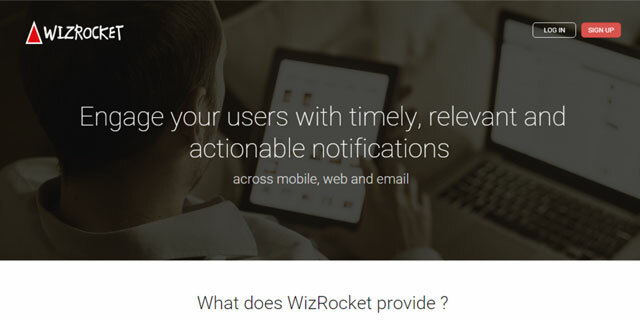 WizRocket had raised seed capital of $1.6 million from Accel Partners in July 2014. “WizRocket is amongst the new breed of startups that are building world-class products by observing mobile-first and mobile-only user behaviour,” Prashanth Prakash, partner at Accel Partners India, said. WizRocket also lets web businesses discover people, events and behaviour on their websites and mobile apps. It can then apply behaviour trends to improve retention, engagement and conversion rates. "I hate spam in my mobile notifications box. So, it’s terrific to partner with WizRocket to solve this problem by personalising mobile messaging,” said Mohit Bhatnagar, who is leading the investment for Sequoia Capital India.